Букский каньон - Welcome to the Buky Canyon website! Welcome to the Buky Canyon website! 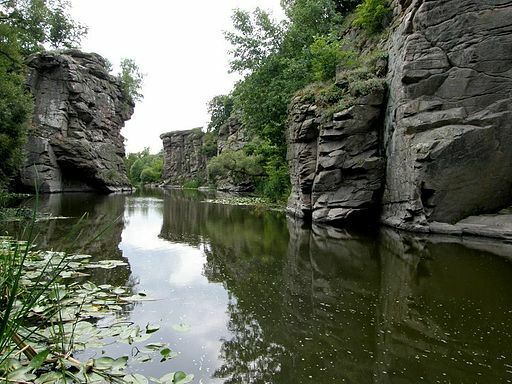 Buky Canyon remains one of the hidden gems of Ukrainian attractions. Located in the heart of Ukraine, about 180 km away from Kiev and 30 km away from Zhashkiv. This is relatively small, approximately 5 km (or 3 miles) long, 20 m (22 yd.) deep and anywhere from 20 to 40 m wide. This canyon was formed by the Hirs’kyi Tikych river in the crystalline rocks of the Ukrainian shield. These Precambrian granitic rocks create a picturesque landscape in the form of steep cliffs and tumultuous rapids.